The fantastic super hero art on this bounce and slide makes it an excellent choice for the children parties. 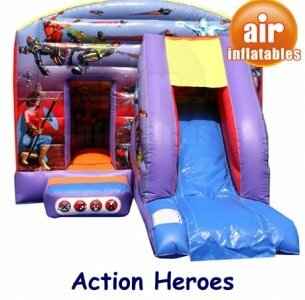 Watch your little ones jump, bounce and slide with their super heroes in the 12ft x 18ft Action Heroes Bounce and slide castle. The castle also has two windows in it adding to the fun, both the windows are netted. Its perfect dimensions give the children enough room to play and have fun. This bounce and slide castle is ideal for both outdoor and indoor environments, a rain cover is also included with it.